Jim Aikens (from left), Bruce Ritter, Steve Currins, Tom Gavin & Art Pahl. Cross Country is over, Football is over, and all the fall sports are over. Winter sports have begun, and many preseason track and field training programs have gotten underway. 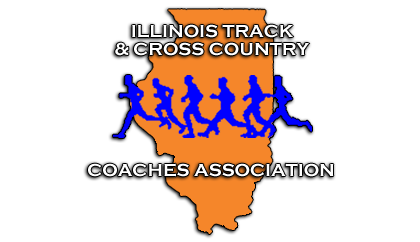 It won’t be long (six weeks, in fact) until the 57th Annual Illinois Track & Cross Country Coaches Association (ITCCCA) Clinic will be held at the Westin Hotel in Lombard, Illinois on January 11th & 12th. Let me tell you, I can’t wait! I love going to this clinic–it is one of my favorite weekends of the year. The ITCCCA clinic has always been a great kick start to the season for me! It serves as a great reminder that the season is right around the corner. This is the third year of having a two-day clinic at the Westin Hotel in Lombard, IL. I think moving the clinic to its current location took the clinic to a whole new level. Oak Park River Forest High School was a good location for the clinic with its history and multiple classrooms, but let’s face it parking sucked and some rooms were hard to find not to mention crowded. At the Westin, the parking is almost limitless, the rooms are larger and easy to find and we can enjoy a few libations from the portable bars in the hallways on Friday night. Nothing like listening to Boo Schexnayder talk about jumps or sprints with a cold beer in your hand. This year’s clinic has another spectacular line up of great speakers but as much as I enjoy listening and learning new things from the presenters, I enjoy the opportunity to hang out and see all of my coaching brethren. I get to talk and hang out with coaches in the hallways, or on Friday night at the Coaches Social (with alcohol and lots of free food) or even hanging at Harry Carry’s restaurant/ bar after the Friday Social ends. I’ve had some great times talking with Tony Holler about coaching philosophies and sprinting and even discussing our political and educational views. I enjoyed going over drill progressions with other coaches in the hallways or in a little alcove somewhere. More than once, I have spent time hearing Dan McQuaid telling war stories about places we’ve been to or things we’ve done and listening to him exaggerate about how old I am. It’s a blast catching up with my south side coaching buddies who I haven’t seen in person since last year’s clinic. It’s great connecting over a drink or two with younger coaches who are eager to learn. The clinic brings back memories as well. I remember when I was a young coach and legendary throws Coach George Dunn from Oak Lawn would sit and shoot the breeze with me about throwing, or maybe it was that I pestered him, I forget. In fact, George–along with watching the Hall of Fame inductions–was one of the main reasons I got involved in the whole ITCCCA thing. I realized as a young coach what a great opportunity this clinic was, not only for what I learned from presenters, but for who I met, the connections I made and what I learned from those coaches I met. Switching to the two-day format and adding the Social has made the clinic even better than it used to be! As far as the presenters go, this year’s clinic is amazing! Check out the clinic lineup (be sure to scroll down the page for the clinic line up). Boo Schexnayder is speaking, and if you haven’t heard him you don’t know what you’re missing. Dan Pfaff, one of the greatest jump coaches our country has produced is talking. Olympian and Indoor World Champion in the shot put Ryan Whiting is coming to do four sessions. For the distance crowd, Jeff Messer from Desert Vista HS in Arizona is talking. I heard him speak in 2011 (back in my cross country coaching days) and he was phenomenal. ITCCCA has brought in those great speakers plus many more such as Kevin Gummerson, Ryan Banta, Rob Assie, Nick Garcia, and many more, you have got to check it out! The other great thing that has been added to the clinic that wasn’t always there in past clinics is that there is something for everyone. If you’re a Middle School coach, there are sessions designed specifically for Middle School coaches. If you’re a beginning coach in an event or are new to Track and Field, there is a Beginning Coaches Series. Almost all of the presenters I have seen realize they are talking to high school coaches, and most of us don’t coach seven-foot high jumpers or 10.2 hundred-meter guys or four-minute-flat milers. Most presenters are very practical and provide solid information that coaches can use. In closing, I guess the reason why I wrote this little blog was that I don’t want you to miss this great clinic. If you haven’t gone in the past, go this year–try it, you might like it. If you have gone in the past you know how wonderful it is. Either way, you need to get signed up soon. Winter break will be here before you know it, and then it will be January and BAM! The clinic has arrived.